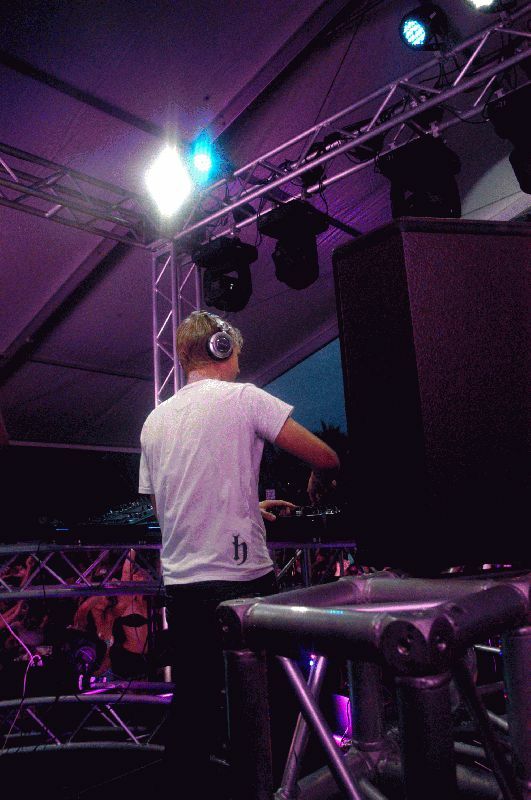 CHAUVET® fixtures were chosen to light performances by a line up of DJ stars including top-ranked DJ Armin Van Buuren at the sixth annual IndepenDANCE Pool and Beach Party (http://www.youtube.com/watch?v=tIoQqC4bL4M) in Miami Beach, FL. Nick Assunto, CEO of Visual Formula specified and installed all the lights for the July 4th event, which took place on the outdoor grounds of the swanky Doubletree Surfcomber Hotel Miami-South Beach. Trance DJ Van Buuren consistently ranks amongst the top-10 in globally recognized DJ polls, and has held the number one spot on DJ Mag’s top-100 list of the most popular DJ’s for the past three years. His most popular songs on iTunes include: “In and Out of Love (feat. Sharon den Adel)”, “Never Say Never (Alex Gaudio Remix) [feat. Jacqueline Govaert]”, and his recently release single, “Full Focus”. His performance capped a 12-hour show that included well-known international DJs Sander Kleinenberg and Avicci, along with prominent locals Rony Seikaly, Patrick M, Louis Puig, Lazardi, and Riotgear. CHAUVET® fixtures illuminated the main stage and VIP areas. Assunto used LED-fitted, multicolored COLORado™ 3P, COLORado™ 1 TOUR, COLORado™ Batten 72 TOUR, and COLORado™ 1 lights for truss warming, backlighting and to illuminate the crowd as well as COLORado™ 1 VW lights which produces various shades of white. Overall, the ruggedness and rich output of the wash lights pleased Assunto, who said he “fell in love with” the newer COLORado 1 Tour lights. “There is no question, after this event we are definitely going to increase our inventory of the COLORado 1 TOURs,” he said. To complement the wash lights and add rhythm to the presentation, Assunto used CHAUVET® moving yokes Q-Spot™ 575 fixtures. Affordability also influenced Assunto’s selection of CHAUVET® fixtures. He said, “In an outdoor event especially, it is essential to get the maximum output for your budget. With CHAUVET® the same investment will give you much more fixtures." Despite drizzling rain during most of the day, the event was a success. "The fixtures performed flawlessly," Assunto said.